Due to its higher output voltage a voltage tap can be connected to a variety of third party potential devices and sensors for various relaying, measuring and insulation monitoring solutions. However, these devices are expensive to install and operate, requiring communication cabling to separate data processing devices and specialized software. The user is also faced with having to effectively manage the vast quantities of data generated and providing appropriate levels of maintenance to keep these devices operating reliably. The smart RIF® bushing provides a simple and economic alternative for insulation condition monitoring of the bushing. 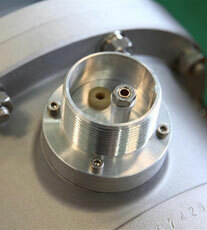 Condenser-graded insulation can be modelled as a series of capacitors separating the conductor and ground. During the process of insulation breakdown screens fail sequentially eventually leading to total breakdown of the insulation. As subsequent screens breakdown the capacitance and capacitance current gradually increases. 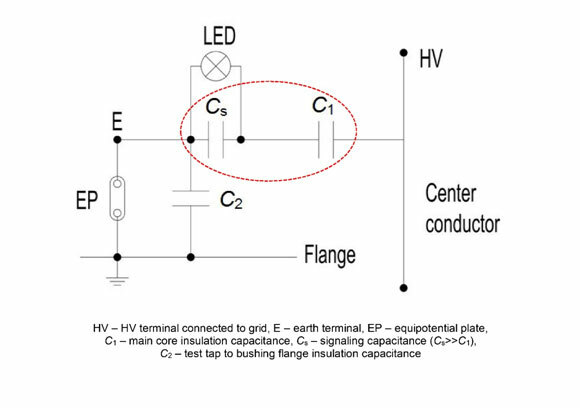 The smart RIF® bushing is manufactured with a large Cs capacitance (Cs˃˃C1) integrated into the condenser core to create a capacitive voltage divider for accurately measuring these changes (see Figure 1). 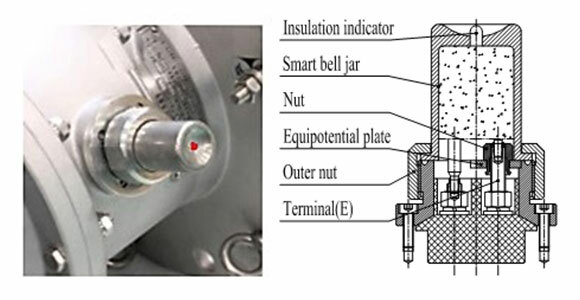 The 2 ends of Cs are brought out to a smart measurement terminal installed on the bushing mounting flange where a factory calibrated LED sensor can be plugged-in to collect and process the signal (see Figures 2 and 3). This integrated monitoring system requires no external power source as it is powered from the grid. It is effectively isolated from the HV insulation system so that operational mistakes (e.g. open or short circuits) will not damage the HV insulation. Consistent monitoring accuracy is ensured by a high interference shielding design and insensitivity to changes in temperature or frequency. No human intervention is necessary and no processing of data is required. The LED lights “Green” for normal condition and turns “Red” should a change of capacitance be detected in the condenser core. The LED “Red” indication is only a pre-alarm of a deteriorating condition and allows the utility time to schedule future options for the affected equipment. There is no risk of an imminent failure as lab testing has shown that subsequent failures of capacitive screens will be very slow. Access to the test tap for off-line testing is very straightforward and just involves unplugging the LED sensor and removing the equipotential grounding plate (see Figure 4).